The Perfect Buy for Christmas? Give the Gift of Retail Stocks! It looks like the Great Mall-pocalypse of 2017 may have finally run its course. In particular, the “death of retail” is probably the most overwritten, overhyped story in the business universe. No one will ever go out to shop ever again. The streets around your favorite retail shopping district will be empty. The only traffic will be UPS freight vans, using tumbleweed-strewn mall access roads as shortcuts between neighborhood Amazon deliveries. Oh, and don’t forget the airborne delivery drones. I’m sure the sun will be partially blotted out each afternoon as whole squadrons whiz past. Yesterday, GGP Inc. (NYSE: GGP) received a buyout offer from Brookfield Property Partners LP for $14.8 billion — about $23 a share — to take the mall owner private (Brookfield already owned about one-third of GGP’s stock). The acquisition rumor has been floating around for a week. In the last five trading sessions, GGP’s stock has soared 18%. 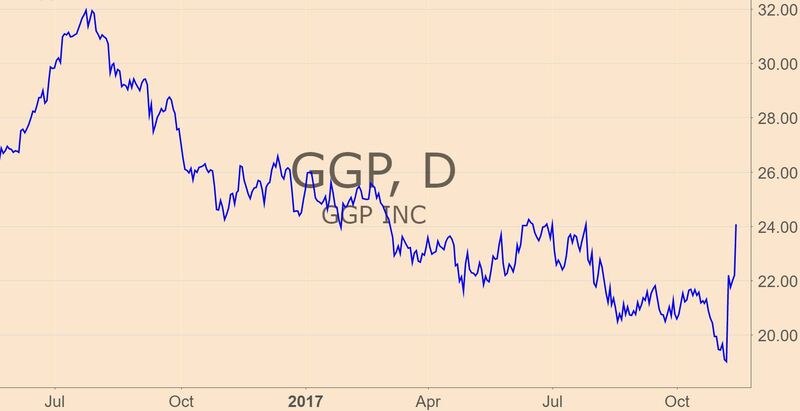 This rebound comes after GGP had fallen 40% from its all-time highs in July last year. Brookfield recognizes a key truth that other investors have temporarily forgotten. Malls have lost traffic with the steady increase in internet retail, but as retail assets — and as real-estate assets — they still have plenty of overlooked possibilities for revenue. Brookfield isn’t the only large investor betting that the Amazon threat is overdone and that publicly traded owners of valuable mall real estate are now in bargain-bin territory. Miller Value Partners — the firm headed by famed mutual fund manager Bill Miller — is betting heavily on the mall retail sector as well. The fund bought stakes in two mall-based REITs, Washington Prime Group (NYSE: WPG) and CBL Properties (NYSE: CBL) in recent months. Warren Buffett’s Berkshire Hathaway has also been buying into the retail real-estate sector with stakes in Seritage Growth Properties (NYSE: SRG) — redeveloping dead Sears store properties — and STORE Capital (Nasdaq: STOR). Amazon has, of course, played a huge role in the downfall of many malls as once ubiquitous retail store chains shutter stores or declare bankruptcy. But when asset prices fall to cheap enough levels, bargain hunters come calling — and that’s exactly what’s starting to happen in the mall REIT sector.